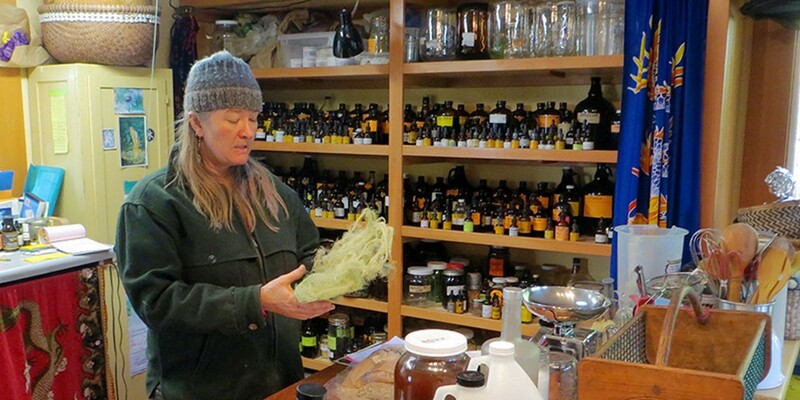 Herbal activist and healer Greta de la Montagne describes the medicinal properties of usnea. It's windy out and the clouds are a bruised, luminous purple not found anywhere, really, except the sky. Thunder rumbles across the bay from Eureka and Greta de la Montagne emerges from the car with eyes to the ground. She promptly spots a clump of plantain. 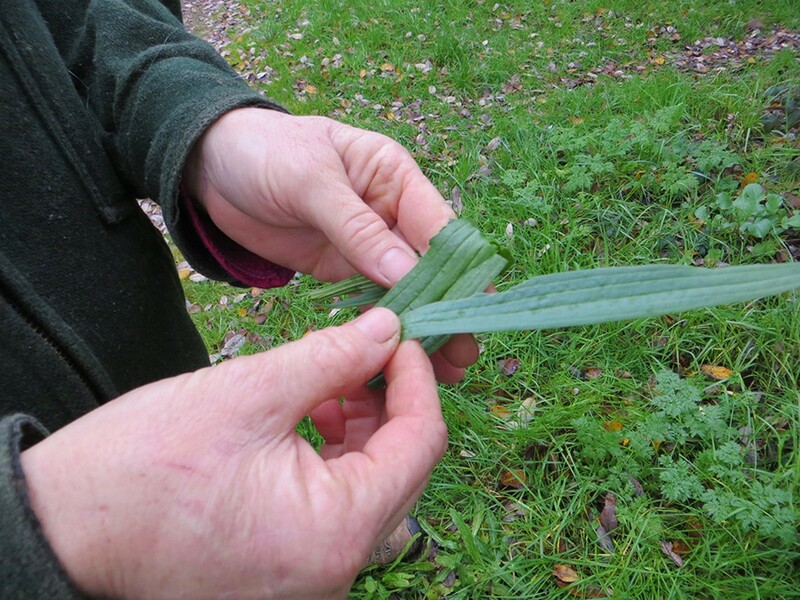 Smashing a leaf between her thumb and fingers she explains, "From a first aid perspective, I always want to have this plant on hand. It's like an herbal Band-Aid." Armored with rubber boots and rain jackets, we continue our blustery journey around the footpaths of Arcata's Marsh and Wildlife Sanctuary. We stop often, inspecting plants as she describes their medicinal uses. There's blackberry root and teasel and dock and dandelion, all with specific and powerful roles in healing. These "starter plants" are good basics for fledgling herbalists to be aware of because they're easy to find and identify. "Once you start paying attention, you'll see a pharmacy all around you," de la Montagne muses. "Some of our most powerful medicines are growing out of the crack in the concrete." Exhibiting the no-nonsense calm and wisdom of a true mountain woman, de la Montagne grew up expeditioning with her parents in Montana's "big wild." She learned early on that if something goes wrong out in the wilderness, you have to heal yourself with what's at hand. Ecology was a big part of her life growing up in Montana but she discovered herbal medicine during treatment for a broken back sustained during training for the U.S. Olympic ski team. An educator and herbal medic, de la Montagne is founder of the Medicine for All Seeking Health and Healing (MASHH) Clinic Collective, a coalition of street and forest EMT-certified women who respond to medical emergencies with herbal first aid. She is also an Ayurvedic practitioner and runs a massage therapy business out of her home. Above all, de la Montagne's mission is to educate people about herbal medical practices that are, she says, all but lost to Western society. These skills, developed over thousands of years, are no longer passed from generation to generation. "How have we allowed that knowledge to be discarded?" she asks. "Allopathy has disempowered the people. We're kind of helpless." From severe burns to dysentery and birth control, de la Montagne maintains all can be approached affordably and easily with herbal treatment. Why spend thousands of dollars at the emergency room when age-old techniques would work, sometimes more effectively? And if things fall apart, we need to have the tools and the knowledge to take care of ourselves. Sound intriguing? Before you haul yourself out into the wilderness with your spade, there are a few things to consider. It's important to be mindful when collecting plants in the wild. Ethics are a big deal. Some ground rules for wild harvesting include taking only one out of every five in a stand of plants. For more rare plants, take one out of every 25. With specimens that grow in circles, be sure to harvest the elders on the outside of the group first. If you're after a plant that reseeds with the wind, you'll want to harvest downslope so the ones at the top can keep reproducing downhill. Also consider what wild animals might be using a plant. Osha, for example, is a sought after herb for humans, but it's also the first plant the bears dig up in the spring. "It's important for their health," says de la Montagne. "They've been sedentary all winter and they need it to get their blood moving." Never gather plants in state or national parks, or on native lands where Native medicine practitioners often foster stands of herbs for tribal use. Remember, too, that other people are out there harvesting, so as a rule of thumb, try to go far away from other humans when you forage. While it's acceptable to harvest commonly available herbs, de la Montagne suggests it's best to leave rare plants for wild animals and skilled herbalists. Also important is the history of the site where you're collecting. She says, "A lot of herbs grow along railroad beds but think of all those years with creosote leaking from the ties. ... You also want to pay attention to logging landings, places where diesel got spilled or who knows what. It can be kind of a gamble; use your intuition." 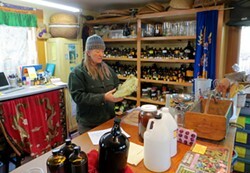 Educating yourself before heading out to wildcraft herbs is a very good idea. 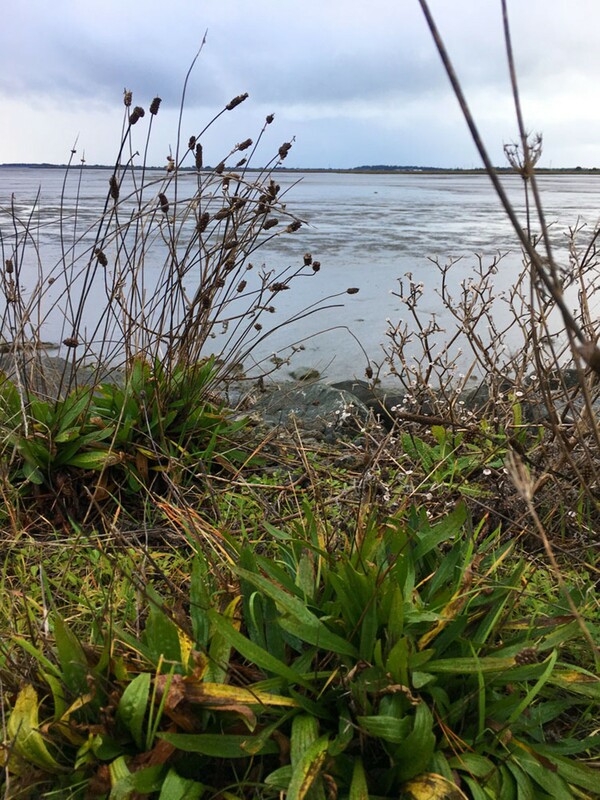 "It's not like you need a botany degree," de la Montagne says, "but if someone isn't paying attention, they could get into a lot of trouble misidentifying plants." Some plants look scandalously alike — so much so that even experienced wildcrafters have met their doom mistaking poison hemlock for wild carrot. As the rain sweps in from the south, we hunker down in de la Montagne's cozy herb kitchen to talk more about her work. On the counter is a pale green puff of usnea, collected after a recent windstorm. The bookshelves are stuffed with literature and a wall is lined with bottles, jars and all manner of intriguing concoctions. "This is a good place to start learning," she says, handing over a copy of her beloved teacher Michael Moore's book, Medicinal Plants of the Pacific West, worn to floppiness. We're fortunate to have a bunch of local herbal education resources. Look to Humboldt Herbals in Eureka, online at www.humboldtherbals.com, for plant walks and herb classes. The local chapter of the California Native Plant Society regularly hosts tours and talks you can find on its website, www.northcoastcnps.org. Also visit Humboldt State's Campus Center for Appropriate Technology's website www.ccathsu.com for its classes. For more information, you can also contact de la Montagne directly at gentlestrengthbotanicals@gmail.com. Finally, if you want to get serious about your practice, check out the Professional Herbalist Training Program at the Northwest School for Botanical Studies, online at www.herbaleducation.net. In the garden, a collection of plump hens shuffle under an 80-year-old apple tree. Even in January, the borage and calendula are doing their best to bloom and a yellow tea rose arcs triumphantly across the afternoon sky. De la Montagne effuses over healing properties of the medicinal plants in her garden. She uses them for first aid, cooking and flea busting, or just to make things smell better. She tells me about the pennyroyal that grows in the ditch up the road and she touches the long strands of the silktassel that hang over the sage she uses in her goat cheese. De la Montagne hopes people will come to realize the value of taking health care into their own hands. What might heal us could well be growing in our own back yard.